The value field is true, double click on it to make it false. 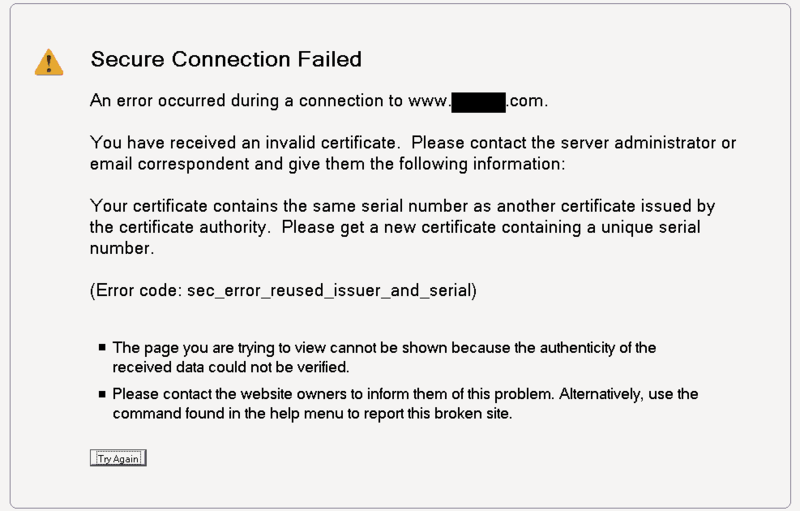 Now try to connect your website again, if you still find ‘Secure Connection Failed’ error then move on to Step 2. If you Computer is configured via Proxy, to access the internet you might get this error. Here, click on the Setting button in the Connection field. You will see a popup on your screen displaying Connection Setting. In the Connection Setting window, see if a Manual proxy connection is selected. If selected, it means that your PC is configured using a manual proxy server. Therefore, you will need to verify if all the protocol fields (HTTP Proxy, SSL Proxy, FTP Proxy, SOCKS Host) have been entered correctly or not. If not, modify them and press OK. If you face any problem during this process, we strongly recommend contacting your network administrator. If you find the Manual proxy connection is not selected, DO NOT make any changes to it. Simply close the window and contact the person who handles your network. Firefox will trigger this ‘Secure Connection Failed’ error or ‘Your Connection is not Secure’ error if the SSL is not configured/installed properly. Sometimes ‘Secure Connection Failed’ error may occur on Firefox if Firefox finds the website to be dangerous or untrustworthy. That is why Firefox browser testing is so critical. If Firefox approves the website, it means that there’s a problem in the SSL connection. SSL (Secure Socket Layer) is a cryptographic protocol that allows users to communicate securely over the internet. A website that uses HTTPS:// at the starting of its URL is said to be a secured website. When Firefox doesn’t find a website secure, it will trigger an error displaying “Secure Connection Failed”. You can test your browser from here – https://weblogin.bu.edu/troubleshooting?cmd=ssl. Get maximum discounts of up to 89% on DV, OV & EV SSL Certificate at CheapSSLsecurity. Boost up customer trust and secure their confidential information with high level encryption.. This entry was posted in SSL Certificate Errors by Mit Gajjar. Bookmark the permalink.